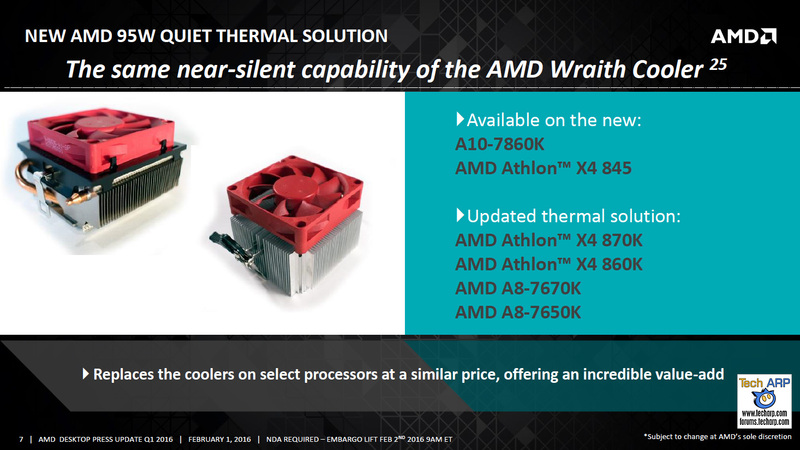 February 2, 2016 – AMD officially launched the AMD Wraith cooler, which they claim delivers better cooling with less noise. They also announced a new AMD 95 W quiet cooler, which also offers quieter performance. Let’s take a look! The AMD Wraith cooler features a heatsink with 24% more surface area, and a more powerful fan that delivers 34% more airflow. Yet it generates less than 1/10th of the noise of the previous cooler. That’s why they called it the Wraith. AMD FX 8370 with the Wraith cooler at the price of the previous AMD FX 8370 with a standard cooler. AMD FX 8370 with a standard cooler at a new, lower price. AMD also introduced a new and improved 95 W quiet cooler for the newly-launched AMD A10-7860 and AMD Athlon X4 845 processors. They promise that it will be almost as quiet as the AMD Wraith cooler. AMD will also offer an improved cooler with selected AMD processor models. They will offer better performance and lower noise levels, just not at the same level as the AMD Wraith cooler or the new AMD 95 W quiet cooler.